Located only 7 miles apart, Antelope Canyon and Horseshoe Bend are a nature hike day made in heaven! 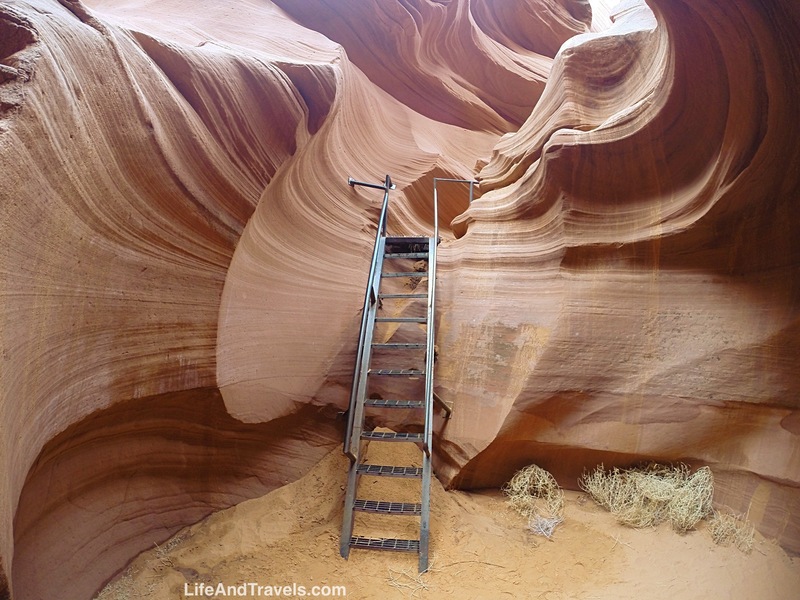 You might have seen pictures of Antelope Canyon and Horseshoe Bend taken by famous nature photographers online or in art galleries and wondered where these spots were located. I had been wondering this myself for quite some time after seeing some of Rodney Lough Jr’s work at an art gallery in Las Vegas. 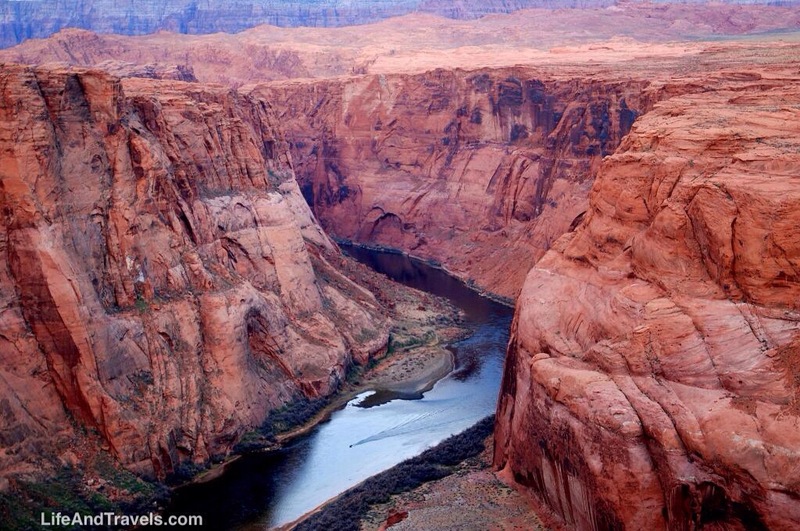 It turns out, both canyons are located just outside of Page, Arizona, USA and only a 10 minute drive apart. Many people don’t realize how close these two trails are and end up only doing one hike on their trip, but you can easily fit both in on the same day. The beauty at both locations will leave you in awe. Let’s go ahead and start off with Horseshoe Bend since this was my first stop. Before my trip, I read online that the canyon is best to photograph at sunrise before you can see the cliff’s shadows on the canyon walls, so I started my day off with a sunrise hike to the canyon (don’t worry if you aren’t there at sunrise, the canyon is gorgeous any time of day.) I arrived at the parking lot located off of US-89 just 3 miles south of Page, AZ, around dawn and started hiking as the sun came up. It’s easy to miss the parking lot turnoff so make sure you look for the small sign on the side of the road. The trail is a short 0.75 mile (1.2 km) hike to the rocky cliff overlook. The hike is easy and there is even a shaded picnic area halfway to the overlook. A small water bottle should be more than enough for this quick hike but keep in mind that in the summer months it will be extremely hot here and there are no restrooms along the trail. 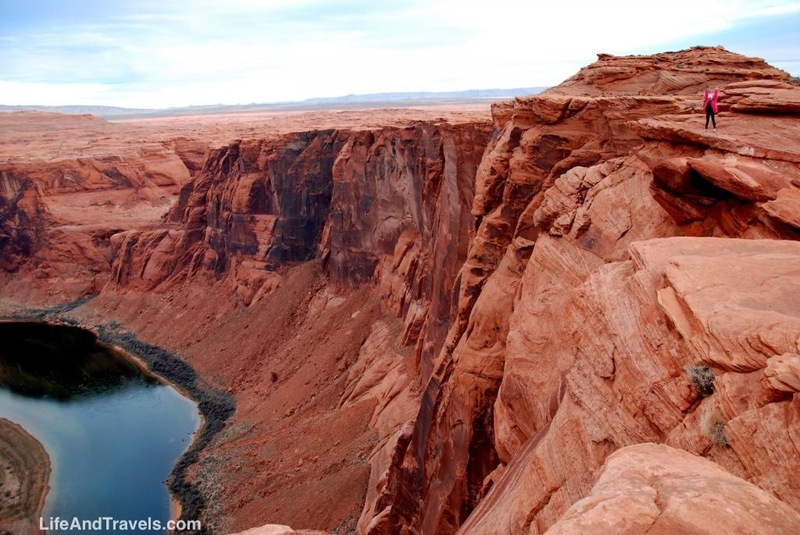 Once at the overlook you will have a beautiful view of Horseshoe Bend and the Colorado River below. Words cannot explain how gorgeous the view is, but be careful as there are no guard rails alone the edge. Make sure to take in the view and snap plenty of photos before heading back to your vehicle. 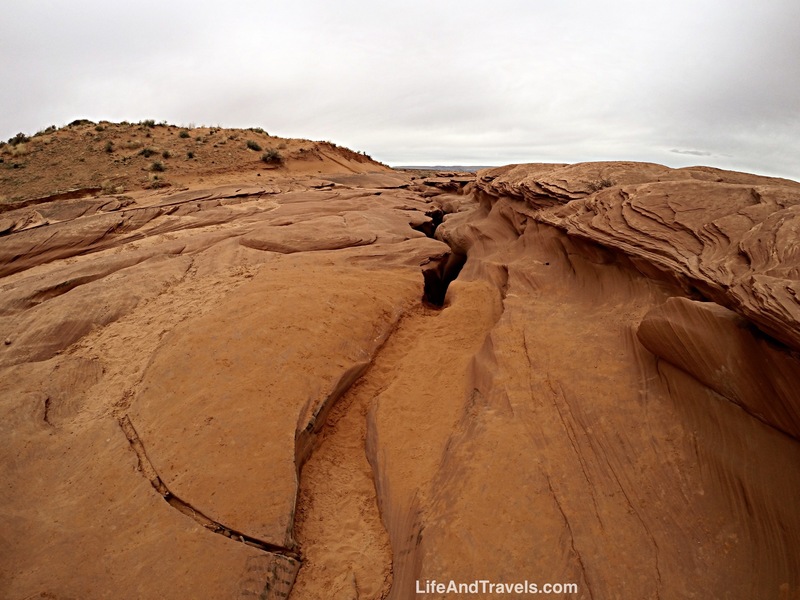 There are two sides of this canyon, the Lower Antelope Canyon and Upper Antelope Canyon. Antelope Canyon is located east of Horseshoe Bend along the AZ-98 highway just 4 miles from Page, AZ. The canyons are on native land and tour guides are required to visit either canyon. I did plenty of my own research prior to heading to the canyon and chose to visit the Lower Canyon. The Lower Canyon is more economical price wise, at $26 per person (March/2014) and a little more adventurous, as you’re required to climb up and down ladders and squeeze through parts of the canyon. The Upper Canyon is more popular though, also making it a bit more crowded at times. Either canyon should be equally beautiful. Feel free to do your own research to decide which canyon you’d prefer to visit, but if you’re in decent shape and unsure, I highly recommend the Lower Canyon. After finishing up at Horseshoe Bend, I made my way east to the Lower Canyon. Heading east on AZ-98 you will make a left onto Indian Route-222. Be ready to make a sharp U-turn onto the dirt road that leads to the dirt parking lot adjacent to the tour desk (shack.) Reservations are not required nor taken for the Lower Canyon. If you’re lucky enough to get a friendly tour guide you might get some good information on the canyon. I wasn’t so lucky as my tour guide barely spoke a word, but he let us freely walk the canyon for an hour as he slowly lead my group through. The slot canyon itself is phenomenal. The entrance starts on the north end and descends down a steep staircase into the slot canyon. 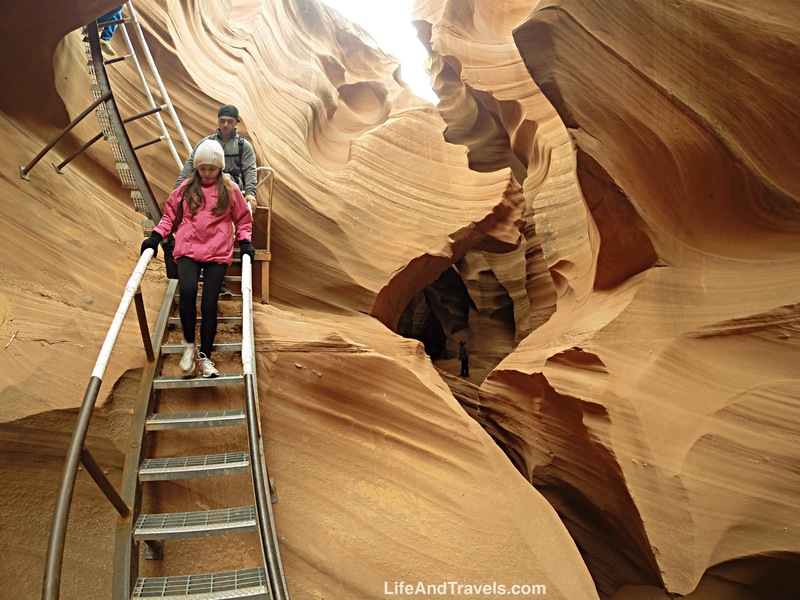 The gorgeous sandstone walls resemble waves as you hike though the canyon. Behind every curve is a more beautiful site. As you weave your way up the canyon, you’ll be pleasantly surprised to see what nature has created. The best time to view the canyons are around noon, when the sun is high and creates sunbeams that reach the ground. The Lower Canyon finishes as you hike up the staircase leading out of the ground at the south end. The Lower Canyon is a one way hike unlike the Upper, which only has one entrance and exit point. The hike is not strenuous but I do recommend bringing at least one water bottle for the hike. Also be sure to check the weather prior to entering the canyon as flash floods are possible. A memorial plaque stands near the trail-head in remembrance of those lives lost during a flash flood in 1997. Be respectful of the land and do not carve anything into the rocks. These were very spiritual places for the original Native Americans. As with any hike, take only pictures and leave only footprints. 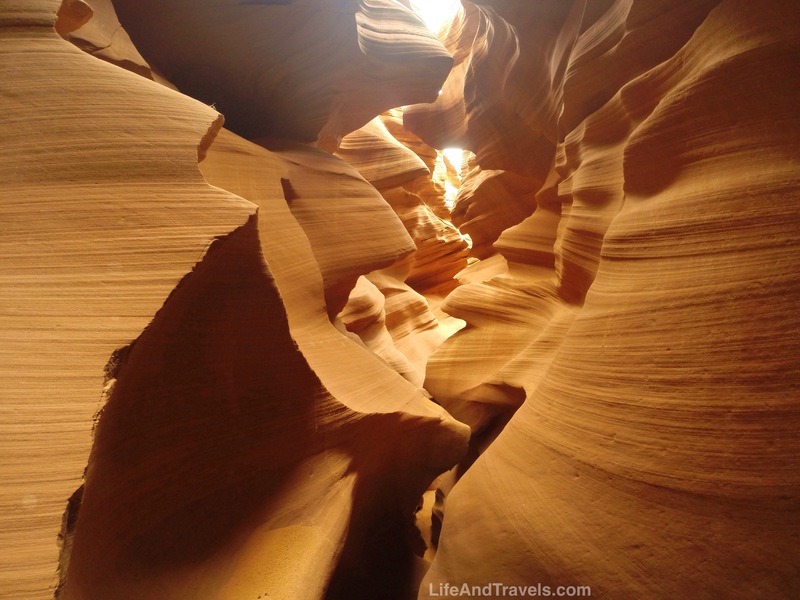 I am planning to go to both Antelope Canyon during Independence Day weekend. 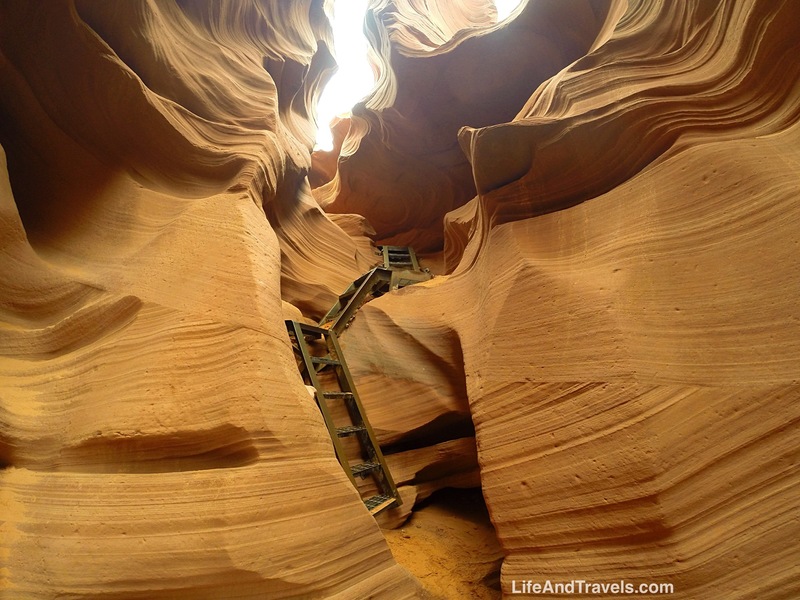 From what I have learnt so far, we can go to both Upper and Lower Antelope Canyons only through tours and I am looking for some tour company that does both. 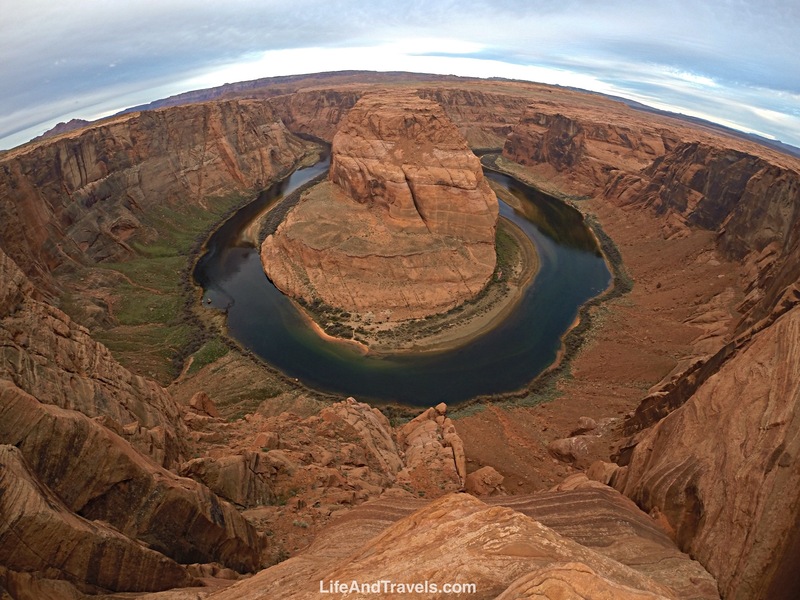 Can we hike to horseshoe bend on our own? Or do we have to do that through a tour too? You do need a guide for both the lower and upper canyon but it’s not through a tour company, when you arrive at the canyon and pay the fee, they provide your group with a “tour guide” to lead you through the canyon. For horseshoe bend however you don’t need a guide. There is a parking lot near the bend and you can follow the trail to the canyon from there. It’s a short walk from the car park.